Anyone who has a child who is a fan of the children’s TV channel Cbeebies, will be familiar with the cute program Cloudbabies. In case you haven’t seen it, there are 4 cloudbabies Baba Pink, Baba Blue, Baba Green and Baba Yellow. They all live in sky and look after the Sun, moon, rainbow and stars. 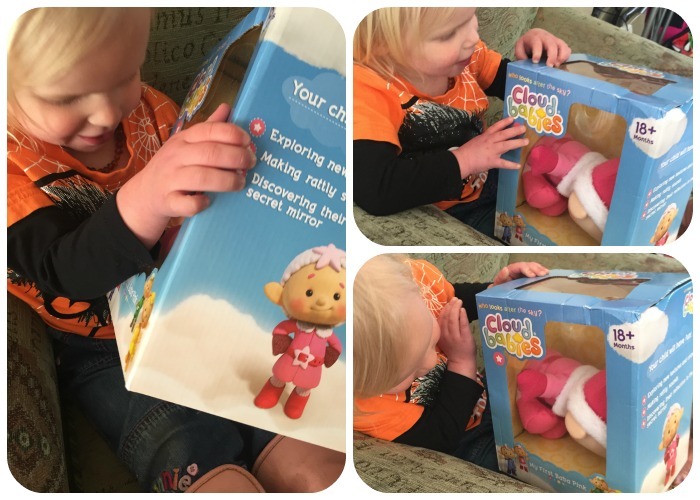 If you have a young cloudbabies fan at home then I can highly recommend buying them a My First Baba toy, initially they will only be available in Baba Pink and Baba Blue. 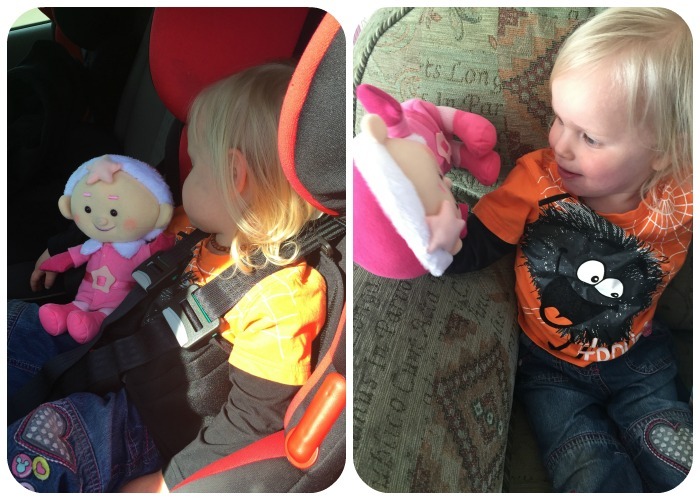 We were sent a Baba Pink for LA to try out, and I think its fair to say that it was a winner as soon as she saw it. These pictures were about as close as I have been to the toy since I gave it to her as it is a firm fixture in her arms now and it goes everywhere with her including bed, the trampoline and every school run to take or collect her brothers, even if that does mean she falls asleep. The baby itself is soft, and as well as being very cute looking, it is also extra sensory. Her left foot has a bell in it which makes a soft jingling sound whenever Baba Pink is moved and the right foot is crinkly. Hidden inside the coat of the cloud baby is a small round mirror which gave LA much enjoyment when she found it. The cloudbabies will be available to purchase for £19.99, this price seems more than resonable for the quality and is suitable for ages 18 months +, for more information click here Check back for some more detailed pictures if I can sneak it away from LA for 5 minutes. Disclosure: I was sent this item F.O.C for the purposes of this review all words and pictures are my own.